Houghton Mifflin Harcourt, 9780547560694, 656pp. Giving voice to the voiceless, the Chicago Defender condemned Jim Crow, catalyzed the Great Migration, and focused the electoral power of black America. Robert S. Abbott founded The Defender in 1905, smuggled hundreds of thousands of copies into the most isolated communities in the segregated South, and was dubbed a "Modern Moses," becoming one of the first black millionaires in the process. His successor wielded the newspaper’s clout to elect mayors and presidents, including Harry S. Truman and John F. Kennedy, who would have lost in 1960 if not for TheDefender’s support. Along the way, its pages were filled with columns by legends like Ida B. Wells, Langston Hughes, and Martin Luther King. ETHAN MICHAELI is an award-winning author, publisher, and journalist based in Chicago. He was a copy editor and investigative reporter at The Defender from 1991 to 1996. —Alex Kotlowitz, author of There Are No Children Here. 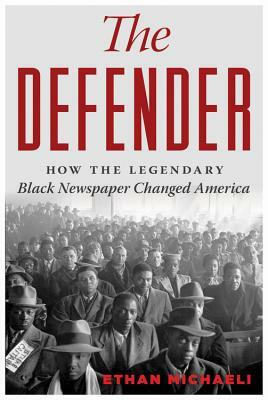 "With meticulous attention to detail and in immensely readable prose, Ethan Michaeli, who once worked for the paper, tells The Chicago Defender's story and, through it, that of African Americans in the twentieth century. It is a masterful work that goes a long way toward explaining why we are where we are now."